Is there a more fitting city in America for the Redskins to call home? Washington D.C., symbol of pointless posturing and infuriating inaction, is the exact right place for this perpetually underwhelming squad to play half of its games. The Redskins’ general ineptitude is made all the more irritating when you consider the fact that as a sports town, Washington is home to a World Series contender in the Nationals, a consistent playoff team if not a Stanley Cup threat in the Capitals, and a rising young eastern conference power that should have legitimate designs around a conference finals run or more in the Wizards. Yet in spite of all these realities, this is still a Redskins town. Some have speculated that their tight grip on this Northern Virginia and Western Maryland enclave has loosened in recent years, but don’t be fooled — these fans have long memories. Incidentally, those have really come in handy as the last periods of sustained success get buried deeper and deeper in the archives with each successive year. Unlike Tampa Bay and Tennessee, whom casual fans had likely forgotten about before they grabbed their new franchise quarterbacks, or Jacksonville and Oakland, who have been largely forgettable for at least the better part of a decade, the Redskins play in a huge media market and are always in the news. Sometimes, it’s for controversial reasons. Others, it’s because their “humble” star-crossed quarterback is bragging on Twitter about how hardworking and humble he is or just fighting with a “hater.” Others still, their goofball owner is doing something goofy again or the latest in an endless line of outspoken, underperforming head coaches has gotten himself in hot water by stepping in front of a mic. Despite the fact that it doesn’t seem like football pundits are predicting much from Washington this upcoming season, it doesn’t change the fact that every year they compete and come away with a another below average record feels like a deep disappointment. Their habit of shooting themselves in the foot notwithstanding, its their history and the intense media focus on this team that really plays into that notion. If they swapped places with Jacksonville, they’d go undetected. Ironically, they also might start winning. (via free agency and trades) — DE/DT Stephen Paea, DE/DT Ricky Jean-Francois, NT Terrance Knighton, CB Chris Culliver, S Dashon Goldson, S Jeron Johnson. OUT: RB Roy Helu, WR Leonard Hankerson, OT Tyler Polumbus, G Chris Chester, DE/DT Jarvis Jenkins, DE/DT Stephen Bowen, NT Barry Cofield, DE/OLB Brian Orakpo, CB E.J. Biggers, S Brandon Meriweather, S Ryan Clark. On the surface, you can see that the ‘Skins have made something of an overhaul at all levels of their defense, switching out veterans and infusing some much needed youth to their secondary and linebacking corps in particular. Will it help? It’s debatable. The defense ranked 20th overall last season, but quietly stood a solid 12th against the run. Terrance Knighton and Ricky-Jean Francois bring some name recognition to that frontline, but aren’t necessarily a run-stopping upgrade. As far as the secondary is concerned, Chris Culliver is a veteran starter and Dashon Goldson is an improvement over Ryan Clark at safety. The much maligned Washington offense isn’t actually as bad as advertised, coming in at 13th overall, but for much of the past two seasons it’s looked unbalanced and stagnant for too many long stretches. Are they a vertical, pocket passing team that makes use of deep targets like DeSean Jackson or are they a Read Option outfit that runs first and passes second? 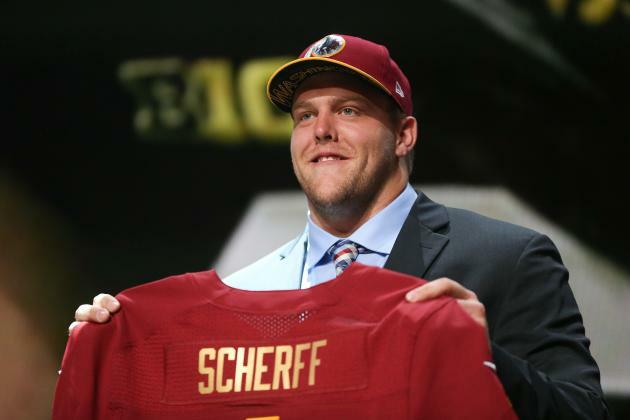 Whatever decision they make this season, the hope is that additions like Brandon Scherff go a long way towards keeping whoever is playing quarterback for this team upright, as Washington’s signal callers were sacked a second-worst 58 times last season. Another area of concern has to be Red Zone scoring – Washington put up just 18.8 points per game last season, good for only 26th in the NFL, and much of that had to do with their converting only 23 of their 48 Red Zone attempts. Not to mention their putrid, third-worst –12 turnover differential. 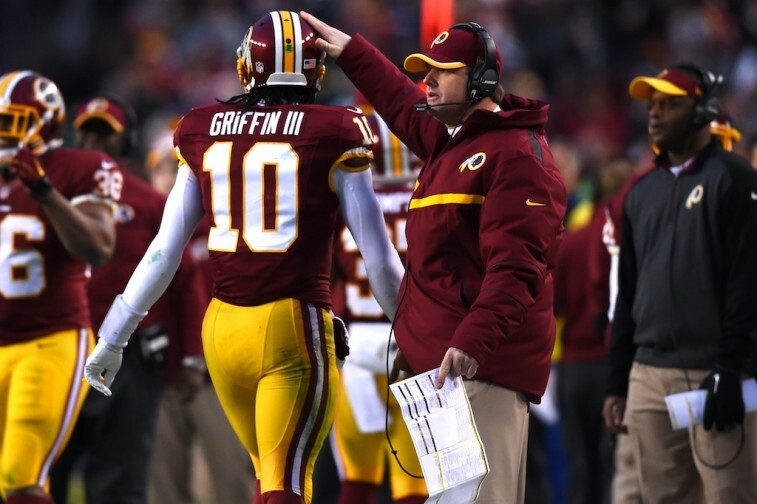 It sort of goes without saying that getting the Redskins back on track (or on track at all) relies almost exclusively on the ability of Jay Gruden and Robert Griffin III to thaw their icy relationship and come up with a compromise that allows this offense to function as effectively as it did in Griffin’s Rookie of the Year 2012 campaign. The schedule is a manageable 20th in terms of strength and includes plenty of beatable opponents such as the Jets, the Falcons, the Buccaneers, the Bears, the Saints, and even clubs like the Dolphins, Bills, and Rams. That’s to say nothing of divisional games against the Giants, whose alleged “improvement” is media manufactured, and the Eagles, who’ve put their faith at QB in the perpetually injured Sam Bradford and will turn to The Sanchize when Bradford inevitably gets injured again. If they have to put in Matt Barkley or go with a Tebow redux, lookout; Chip Kelly’s seat will be scalding hot. All in all, we’ll return to our original point: the Redskins are absolutely perfectly placed in Washington. Just like the other famous figures who live and work in town, they routinely juxtapose the brilliant with the bone-headed. Glorious, garish, or somewhere in between, it’s very difficult to take your eyes off of this team. Prediction: This is a real limb, but we’ll say Washington makes the leap forward to 8-8. They won’t be great and they’ll have a hard time knocking off the Cowboys either of the two times they meet, but from RGIII to Pierre Garcon to Jackson to Alfred Morris, there’s simply too much talent on this roster for them to not at least partially get things figured out.